Offering a level of sound quality that is far above competing receivers, the AVR750 is an audiophile product by any measure. Equally at home with high resolution surround sound or two-channel music, the AVR750 delivers stunning realism with everything from heavy-weight blockbusters to your favourite concert video. 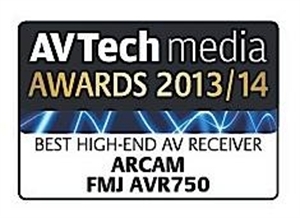 The AVR750's natural habitat is within high performance cinema installations. It is comfortable driving any loudspeaker to extremely high levels and delivers a sonic detail and emotional connection that quickly takes listeners to the very heart of the movie or music. Both video and audio stages are designed to embrace both current and upcoming technologies. 4K "Ultra HD" (HDMI1.4) and 3D video capability are built in, while both standard and high definition sources can be scaled to any resolution where required. Fully control this product with your iPad and the FREE ArcamRemote App!